The Make-A-Wish Foundation has replicated the ship of Star Wars' most wanted bounty. Over the years, the Make-A-Wish Foundation has granted the utmost desires of nearly 200,000 children with life threatening diseases, sometimes bringing them into contact with their favorite celebrities or allowing them to get behind the scenes of World of Warcraft. This time, the organization has assembled a fort topped with a highly detailed Millennium Falcon replica from Star Wars. Forts by themselves are cool enough, but a fort topped with the vehicle of choice of Han Solo and Chewbacca hits it out of the park. The replica was designed and built by Little Mountain Productions for a 9-year-old named Christian. 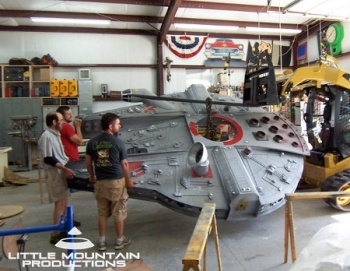 Brandon of Little Mountain Productions told Geekologie that its Millennium Falcon even has "solar powered LED interior and exterior lighting." Awesome! To get an idea of the Falcon's scale, well, it's wider than an SUV. It looks as if it was made so that young Christian can climb up through the fort and stick his head into a plastic bubble on the top to pretend that he's piloting it through the Death Star. Whether the rest of Christian's fort is as cool as its topper remains a mystery for now, but I think you can bet that the kid's parents are going to have to pry him away from the thing. He might as well just move the whole family in and make them the ship's crew.